Ballston Spa Dentist 'The Smile Guy' Offers Solution To Leftover Halloween Candy - Send It To Our Troops! BALLSTON SPA NY — Long after the Trick-orTreating is over and the costumes have been stowed away, we have that never-ending stash of Halloween candy still haunting us for weeks. Although we can't help but feel a little guilty downing another Tootsie Roll, we wonder if there's any relief on the way. That's where "The Smile Guy" comes in. In Ballston Spa, Dr. Dreher is a dentist affectionately known as The Smile Guy, and he has a great solution for ridding your house of Halloween candy and saving your sweet tooth from further decay! The Smile Guy is accepting candy drop-offs 9 am to 5 pm on November 2nd, 3rd, 4th, 9th and 10th. 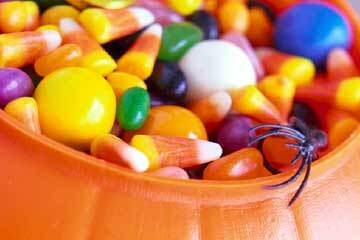 Naturally, this dentist doesn't plan to eat all the candy himself! He donates the candy to our troops overseas. Last year, the Smile Guy and his staff sent 100 pounds of Halloween candy overseas for our troops to enjoy. This year, they hope to meet or beat that goal, and with your candy donations, you can help make that possible. He'll even pay you for your sweets! The Smile Guy will pay $1 for every pound of candy you bring in. What a great way to persuade the kids that this is a good idea! The Smile Guy is located at 410 Rowland Street in Ballston Spa. Learn more about this dentist. For more information, call Dr. Dreher "The Smile Guy" at (518) 885-6185.